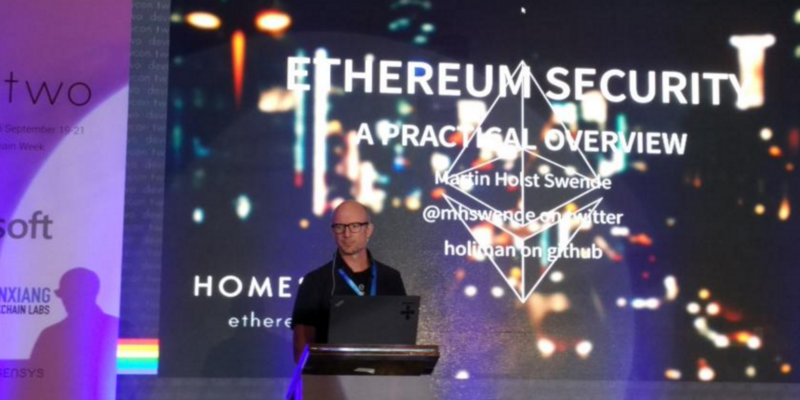 Nasdaq information security specialist Martin Holst Swende has officially joined the Ethereum Foundation as its full-time security lead. Despite it being one of his first days on the job, Swende was highly visible at Devcon2, the non-profit’s annual conference, on Tuesday. There, he moderated a panel on smart contract security and gave an overview of his view on the state of the blockchain-based decentralized application network. Offstage, Swende opened up about his new role, explaining that he doesn’t believe it was a risk for him to move from the stock market giant to the nascent blockchain industry. Swende told CoinDesk that his now former colleagues at Nasdaq (he wasn’t involved in its blockchain work) were largely positive about the move, suggesting the stigma of leaving the financial industry for a blockchain startup may be dissipating. From a glance at the Devcon2 lineup, Swende is not alone in his background. Enterprise firms including Microsoft and IBM are set to take the stage at the event, and Santander, while not present, made waves revealing its intent to issues digital money on the ethereum blockchain. But for Swende, the news is perhaps less surprising, as he had long been courted by the 40-member Ethereum Foundation due to his work on its bug bounty program. Swende was the most frequent contributor, reporting issues with the python client and go client, and collecting a fair share of the rewards. Swende said his own interest in the project started before its crowdfunding effort in 2014, though he’s not exactly sure how he stumbled on the original blog posts from ethereum creator Vitalik Buterin that caught his eye. Still, he said he remembers the impression reading Buterin’s work left on him. “It was eye opening. I just read about this cool technology. I didn’t know he was 20 years old,” Swende said. In addition to piquing his intellectual interest, though, the new role will find Swende coordinating with all the various projects funded by the Ethereum Foundation in order to enhance their security. In particular, Swende will now have the difficult task of helping to ensure that development on ethereum continues safely, even while basic components of the network remain very much in early development stages. Swende said he intends to strive to be better at providing information for smart contract developers, and that this will include the creation of a security website. “We need to be better at documentation and also there’s some work to do in the tools and language features,” he said. Still, Swende acknowledged that the collapse of The DAO gives his role an added weight. A smart contract that raised $150m this summer (only to quickly lose nearly half of it due to a security flaw), The DAO was a frequent topic of focus at the day’s event. While Swende said he doesn’t want the situation to repeat, he also admitted a certain regret that he never inspected the original contract. “A guy asked me if I was going to invest, and I said I hadn’t audited it,” he recalls.